Calling it a "busy and challenging quarter," Apple Chief Executive Tim Cook gave commentary and fielded questions on his company's fiscal 2016 second quarter. Notes of interest from the call with investors and the media follow. 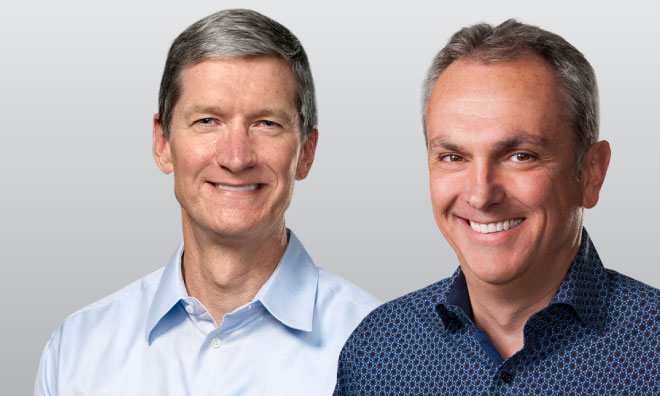 In addition to Cook, also participating in Tuesday's call was Chief Financial Officer Luca Maestri. iPhone customers are incredibly loyal, Cook said, noting that studies show the highest retention level of any smartphone. Apple added more switchers from Android in the first half of this fiscal year than any other six-month period ever. iPhone sales were up 56 percent year over year in India. iPhone SE was not reflected in March quarter results, but Cook said so far it's seen "terrific customer response." On the iPhone SE, Cook said there are "even more people than we thought" who wanted the latest technology in a smaller package. Maestri revealed that 78% of businesses planning to purchase smartphones in the June quarter will chose iPhone, according to a new survey. Services was the second-highest earner for Apple last quarter, up 20 percent to $6 billion. App Store and Apple Music revenue continues to grow. App Store was up 35% to a new all-time high. Music revenue has "hit an inflection point after many quarters of decline," Cook said. He said Apple's 1 billion active devices in use continue to bring in recurring revenue. Apple Pay is said to be adding 1 million new users per week. More than half of Mac buyers are new to the platform. In China, more than 80 percent were new. Maestri said it was a "challenging" quarter for PC sales, with Apple seeing declines, but the company still gained market share. Apple expects the Watch to have seasonality similar to the iPod. Sales last quarter met Apple's expectations. Unit sales of Apple Watch in its first year exceeded iPhone in its first year in 2007. Cook said the Apple Watch has "an exciting future ahead." Apple Watch is now available in 60 countries, Maestri said. Cook touted the launch of the new 9.7-inch iPad Pro, and noted that Apple expects to see its best iPad revenue compares in over two years. Maestri said NPD data shows iPad has 78% share of tablets priced over $200. 451 Research measured a 97% satisfaction rate for iPad Air 2. Corporate buyers reported a 94% satisfaction rate for iPad and a June quarter purchase intent of 71%.